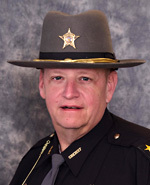 Deputy Borden has worked for the Geauga County Sheriff's Office since 1998. Deputy Borden was assigned to the K-9 Unit in November 2013, at which time he was paired up with his partner Rotar, a full bred German Shepherd male. Deputy Borden and K-9 Rotar certified through the State of Ohio and North American Police Work Dog Association. After completion, Deputy Borden and K-9 Rotar started patrolling in December 2013. Deputy Borden and K-9 Rotar are certified in narcotics detection, suspect apprehension, handler protection, artical search, suspect search, and tracking. Deputy Dhayer has been an employee of the Geauga County Sheriff’s Office since 1994, and has been a K-9 Handler since 2003. Deputy Dhayer and his current partner, K-9 Miner graduated from K-9 school on May 22, 2012. K-9 Miner is a German Shepherd/Belgian Malinois cross. Deputy Dhayer and K-9 Miner are certified through the Ohio Peace Officers Training Commission and the North American Police Work Dog Association (NAPWDA), in narcotics detection and patrol. Deputy Goodwin began his career in law enforcement in North Carolina where he worked as a Deputy for four and a half years before moving to Ohio. Deputy Goodwin worked for the Davie County Sheriff’s Office as a patrol Corporal and K-9 handler. Deputy Goodwin was hired with the Geauga County Sheriff’s Office in July 2013. Deputy Goodwin started in court services and prisoner transport. In November of 2013 Deputy Goodwin was added to road patrol where he trained under Deputy Kracker and Sgt. Jonovich. After completing Field training Deputy Goodwin remained on Sgt. Jonovich’s shift through October of 2015 when he was assigned to the K-9 unit as the new EOD and Patrol dog handler. Argo is a two year old German Shepard from Czech Republic. Argo came to the US in March of 2014 where he was trained in explosive odors detection at Excel K-9 Services by Mater Trainer Paul Shaughnessy in Hiram Ohio. Argo and Deputy Goodwin spent ten weeks together in training learning obedience, tracking, building search, area search, handler protection, suspect apprehension, and explosive odor detection. Argo is certified through the State of Ohio and NAPWDA. Deputy Smith has worked for the Geauga County Sheriff's Office since 2007. Deputy Smith was assigned to the K-9 unit in April, 2012. Deputy Smith was paired with his partner, K-9 Spirit, who is a male, full bred German Shepherd. Deputy Smith and K-9 Spirit are certified in narcotics detection, suspect apprehension, handler protection, article search, suspect search and tracking. Deputy Smith and K-9 Spirit are also certified through the North American Police Work Dog Association. K-9 Spirit rides with Deputy Smith nightly on their patrols and at the end of shift goes home with him.